Our doctors use their advanced training and extensive experience to solve issues you have with previous dental work. 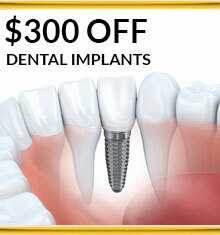 Do you need dental implant fixes? Dr. Meserkhani is an expert in the placement of dental implants. He has placed thousands of implants over the years and is a Diplomate of the American Board or Oral Implantology, a prestigious status only awarded to 400 dentists nationwide thus far. Complications with implants are quite rare, but when they do arise, Dr. Meserkhani has the skills to provide treatment. He will save your existing implant if possible, and if it is beyond rescue, he can replace your faulty implant with a new, healthy and functioning one. Peri-implantitis, like periodontitis (gum disease), is a bacterial infection that affects surrounding gum and bone tissue, causing it to eventually dissolve away. While periodontitis affects natural teeth, gums and bone, peri-implantitis affects the site of a dental implant. Early warning signs of peri-implantitis include red, swollen gums and bleeding when gums are probed. If left untreated, peri-implantitis can result in bone loss around the implant, which makes the implant become unstable or even come loose. All of these aspects must be explored for an accurate diagnosis, and to ensure the best course of action. Dr. Meserkhani will do a thorough oral examination to check for changes in the color of your gums, thinning of gum tissues and signs of infection such as redness or swelling. He will gently probe the pockets between the gums and teeth to check their depth, and obtain X-rays that will show if there is any loss of bone around the implant. Our first step is to assess the severity of the condition. Dr. Meserkhani needs to determine whether the implant can be saved without compromising your overall oral health, or whether the implant needs to be removed and the entire area treated. It is not uncommon for patients who are referred to us, and have had their implants placed by another dental professional, to have a generalized periodontal problem. In these cases it is vital for all gum tissue to be returned to full health, and Dr. Meserkhani will treat your entire mouth, not just the infected implant. Where there is gum disease surrounding an implant, we use a procedure called LAPIP (Laser Assisted Peri-Implantitis Procedure). A laser is used to kill the bacteria, remove infected tissue and to promote healing of the gum tissue. Where bone has been lost, we use the laser around the implants to help stimulate new bone growth. When there is a more severe infection present, Dr. Meserkhani may find it to be necessary to remove the crown (or other restoration), open up the gum, and then gently and thoroughly clean and disinfect the area. When bone has been lost due to peri-implantitis, our doctor may perform bone grafting to restore support for your implants. If extensive bone has been lost, Dr. Meserkhani will use bone graft material mixed with proteins to stimulate the regeneration of bone. In some cases, a dental implant simply must be removed for the overall health of your mouth. An implant may have been poorly placed, was not the appropriate size or length, or there may be other factors that necessitate its removal. When an implant is removed, bone is often taken with it, and bone grafting is required. After the bone has regenerated and the area has healed, Dr. Meserkhani will properly place a new implant post and give you a healthy, functioning new replacement tooth. If you are having problems with the restorations on top of your implants (such as crowns, bridges or dentures), we can help. As a prosthodontist—a recognized dental specialist in the aesthetic restoration and replacement of teeth—Dr. Meserkhani is highly skilled in crafting, repairing and replacing dental restorations, including those that are supported by dental implants. 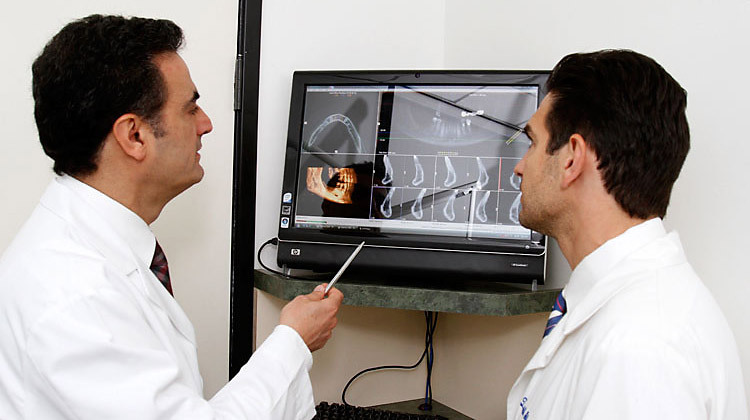 As part of his advanced prosthodontic training, Dr. Meserkhani has received specialized education in proper bite alignment and the correct functioning of the jaw joint (TMJ). He can resolve any issues you may be having with the way your teeth come together, and he can ensure that any new replacement teeth will fit properly and result in good, comfortable bite alignment. Dr. Meserkhani can evaluate your existing restorations and let you know what course of action he recommends.